At MDC Diamonds New York we know what a special time buying a wedding or anniversary ring can be. With our wide selection of diamonds and settings we feel confident that you will find the perfect ring for this special occasion. Choose from white, yellow, rose/pink gold and platinum woman's wedding rings. Choose from white, yellow, rose/pink gold and platinum men's wedding bands. 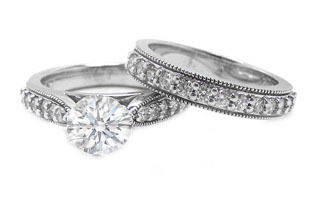 Choose from our many options for woman's diamond and gem stone wedding bands.